On the banks of the Kaw River near its entrance into the Missouri, Kansas City, Missouri. 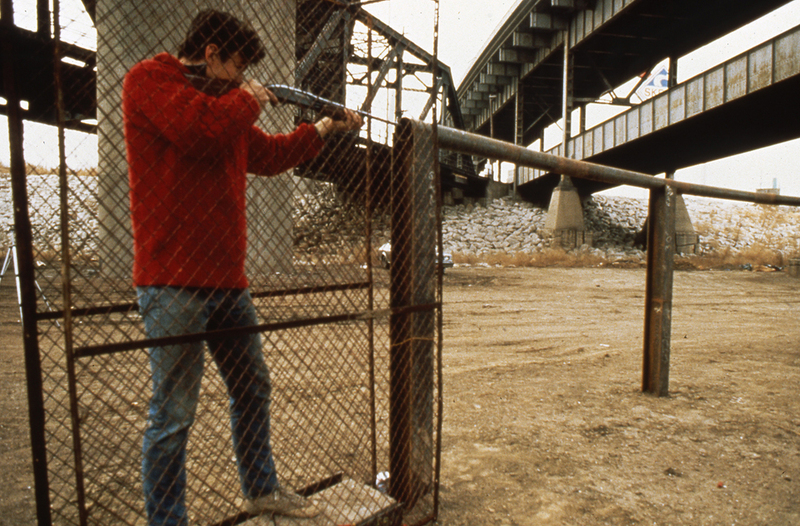 The Gun Sculpture opened in a performance type event of about 35 people. Everyone who wanted to was able to shoot a 12 gauge shotgun into the piece, listen as it rode down the pipe and then see the bullet splash out in the river. Later people would seek me out to experience the piece. We would typically get a small group together of about 5 or 6 people and drive to my house to get the gun. We would then drive to a gun store were mostly art types would walk in and buy shotgun shells through the stares of the counter personnel. (It was 1981 and there were gun stores easy to find) Sometimes people brought their own guns and bought shells for them. 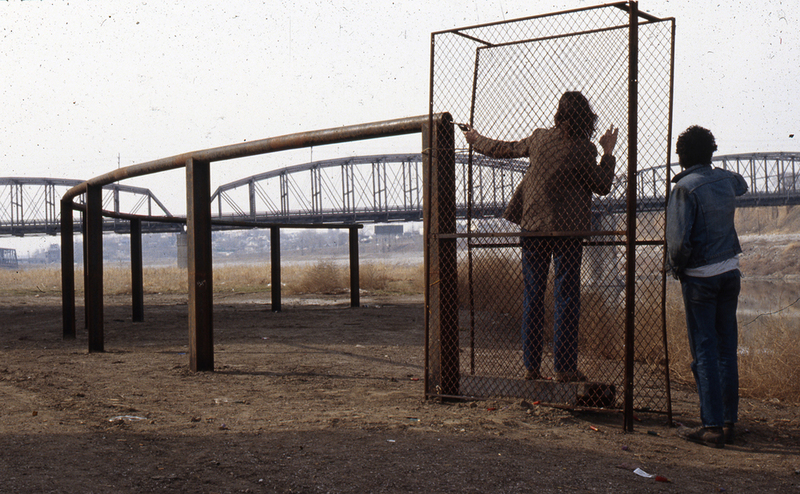 This was Kansas City in the early 1980's. The economy was destitute. We would take a long ride from my house through the city and then down and over the 12th street bridge. Circuitously we would drive the streets of the west bottoms to a small Levee Road that led to the banks of the Kaw river. You always wondered if the car would get stuck on the Levee: it had large ruts in it. People used this area to do various common and nefarious things: some fished; some camped; some would abandon animals, cars, trash and other. It was a liminal place at the edges of two cities, forgotten about in any official way. It was also an industrial intersection. 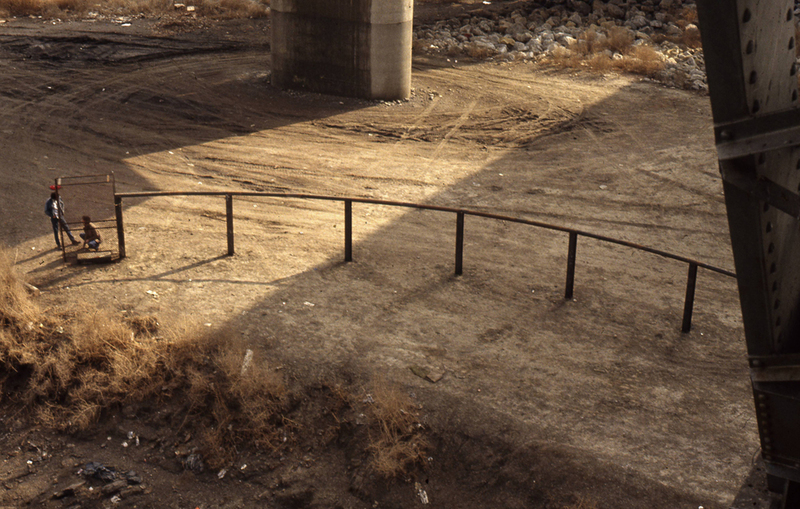 I-70 Highway raced over head, two smaller bridges crossed the Kaw to Kansas City Kansas, and two railroad trellis made their way in two different directions. There was a sewage plant near by, a huge trucking depot too. For all intents it was abandoned to people except for its industrial uses. We would all get out and shoot into the sculpture. Everyone would take their turn. Some quiet people became empowered shooting the guns, others sat it out and declined to shoot. Some couldn't get enough of it. Different guns made different sounds. We talked and laughed and yelled out loud. We talked about art and our ambitions, of Smithson and Matta Clark and the Survival Research Lab. I would talk about the piece and people would laugh and take it seriously too. This sculpture was a guerilla piece in that it was unauthorized. It was on public lands and permission was never sought nor granted for the installation. The sculpture was built with a variety of pressures in mind. It took place against the backdrop of middle America in the 1980's, just the beginning of Regan's term. Nuclear war seemed immanent. I hoped to make a gesture about that, a way that thanatos would be avoided by the small acts of an artist. I had seen a philosophy professor come to class and dramatically drop a piece of chalk on the floor. He then said "i just changed the coast of China" and walked out. i took it to mean that perception was the material of media time. It was an idea later reflected i chaos theory as the butterfly effect. After so many months I took the sculpture down and used all the steel to build a new piece. I visited the site years later to see the water high enough to cover the sculpture, at least partly. I could imagine the pipe just above the water's surface. I visited again in 2009 interrupting people who had an encampment under the bridge.